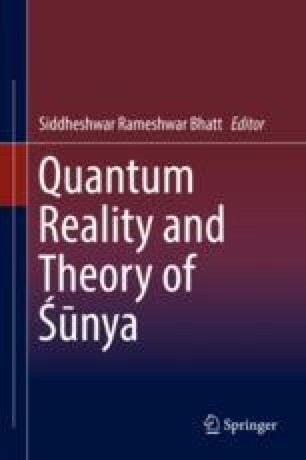 There is a considerable similarity between the physical concept of reality implied by quantum physics and the philosophical concept of reality articulated by Nāgārjuna. For neither is there a fundamental core to reality, rather reality consists of systems of complementary and interacting objects (dharmas). From the perspective of sādhanā (practice), the Mādhyamaka and the Yoga have something in common in that both of them head toward nothingness of “I-ness” (ahaṃkāra). As long as there is “the I,” no-self (anattā) cannot come out, and “non-duality” cannot be realized. The goal of yoga is essentially to cause the mind to become like zero. When we look at the complementarity and interaction of the particles with the observer, we find interesting correspondences between quantum physics and Mādhyamika philosophy. This observation or mental involvement is actually also apparent in the area of yoga and meditation. In fact, one of the most important aspects of yoga practice, even in haṭha-yoga, is this mental involvement. There is a maxim in the field of yoga: “Cakras are fed with observation of yogi.” This means that the act of observation turns potentiality of cakras into actuality. The Śiva-saṃhitā, − A Critical Edition & English Translation by James Mallinson; 2007. YogaVidyam.com.